Vladimir Putin will lead Russia for another six years, after securing an expected victory in Sunday's presidential election. 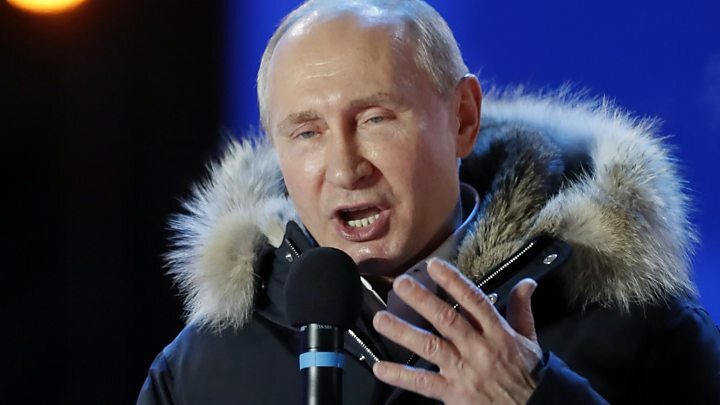 Addressing a rally in Moscow, Mr Putin said voters had "recognised the achievements of the last few years". Speaking to reporters after the results were announced, he laughed off a question about running again in another six years. "What you are saying is a bit funny. Do you think that I will stay here until I'm 100 years old? No!" he said. The scale of victory - which had been widely predicted - appears to be a marked increase in his share of the vote from 2012, when he won 64%. Mr Putin's nearest competitor, millionaire communist Pavel Grudinin, received about 12%. The race also included Ksenia Sobchak, a former reality TV host, and veteran nationalist Vladimir Zhirinovsky - they got less than 2% and about 6% respectively. Mr Putin's campaign team said it was an "incredible victory". "The percentage that we have just seen speaks for itself. It's a mandate which Putin needs for future decisions, and he has a lot of them to make," a spokesman told Russia's Interfax. In some areas, free food and discounts in local shops were on offer near polling stations. Video recordings from polling stations showed irregularities in a number of towns and cities across Russia. Several showed election officials stuffing boxes with ballot papers. Mr Navalny was excluded from the election because of an embezzlement conviction that he said was manufactured by the Kremlin. In his first reaction to the news, Mr Navalny indicated he had been unable to contain his anger. "Now is the season of Lent. I took it upon myself never to get angry and not to raise my voice. Oh well, I'll try again next year," he tweeted. Does Putin's Russia reject the West? Videos taken from the election commission's live stream of polling stations also appeared to show some instances of officials stuffing ballots into boxes. In Dagestan, one election official said he was prevented from doing his job by a crowd of men who blocked the ballot box. But Ella Pamfilova, head of the Central Electoral Commission, said there were no serious violations. "We have analysed and monitored everything we could, everything that has arrived. Thank goodness, it's all rather modest so far," she told a commission meeting while speaking about violations. She had earlier said that anyone involved in violations would be caught. Sunday's vote was also the first in Crimea since Russia seized the region from Ukraine. Mr Putin's victory rally coincided with the anniversary of the annexation. The annexation was bitterly contested by Kiev and ratcheted up tensions between Russia and the West. Russians living in Ukraine were unable to take part in Sunday's vote because access to Russian diplomatic missions was blocked by the Kiev government. Russia election: What do young Russians think of Putin?